Renee has written several books to help put real love and romance into your lives, each drawing from her wealth of experience, interviews, and unequalled insights in the areas of dating and relationships. Those books are Love Mechanics and Get Real About Love and are truly valuable sources of information for anyone looking for true love in their life. Check them both out, below. We all need tune-ups for our cars ... what about our love lives? 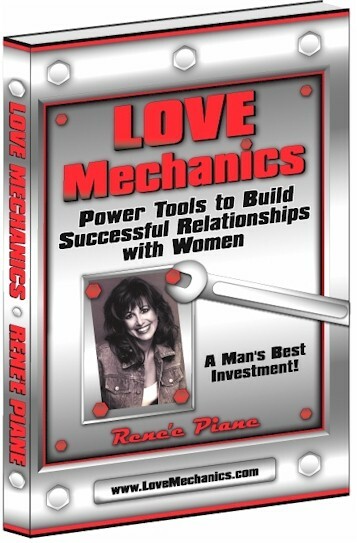 For the single man whose action is stalled, sluggish, misfiring, or overheating, Renée Piane's book Love Mechanics: The Power Tools to Build Successful Relationships with Women is welcome roadside assistance ... a jump-start back on the road to love and companionship. This book is designed to offer simple guidelines to assist men in developing the qualities in themselves that they are looking for in others. This book is written in a familiar style that men can easily relate to. Miss Piane knows how to speak to men and knows what they need to hear to get back on the straight-away. She has been working with men and their relationship challenges for years. In her new groundbreaking book, Renée passes along tools and skills that give men the insight and direction to win at love. She offers straight talk, operating tips, checklists, secrets, and strategies to cultivate incredible relationships. Renée shows how single life can be exciting and fulfilling, whether on a road trip to discover that "special someone" or a chosen single lifestyle. Men have had a tendency to "roll with the punches" and fend for themselves, unless they were blessed with a helpful sister, a caring ex-girlfriend, or a great woman friend. Men have been in desperate need of practical romantic advice. 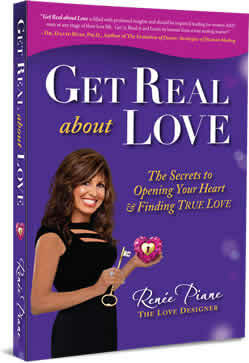 Renee Piane, the Love Designer is a master at connecting people and a pioneer in the dating industry. She's been an internationally known love and relationship reinvention expert for the last 18 years. In 2014, Renee was the winner of The Best International Dating Coach at the I Date conference. As the pioneer and president of Rapid Dating, she has facilitated thousands of love matches and connections with her love seminars and social events. She is a popular radio and television talk show host, guest expert and love advice columnist. A widely acclaimed and sought-after inspirational speaker, author of "Love Mechanics" and her soon to be released "Get Real about Love" series, her work has been featured in over 75 TV and radio shows including: CNN, NBC, ABC, The Today Show, MTV, CMT, Lifetime, KROQ, KISS, The Los Angeles Times, The New York Times, Cosmo and Men's Health. Renee was listed in the Wall Street Journal as one of the 8 resources for singles in America. Renee has been teaching singles the tricks of the trade in the dating game with her powerful seminars and coaching services, helping her clients prepare for love - from the inside out. She has advised singles in their 20s, 30s, 40s and 50s, many of whom went on to find true love. Experience has taught Renee much about the different ways the generations date and helped her to examine the deeper issues people face in today's mad world of dating. Her life is dedicated to helping singles and couples "get real about love" and take charge of their love lives. She draws from her years of research, study and experience in the areas of communications, marketing, broadcasting, psychology, television production, theatrical study, commercial training, alternative health therapies, holistic medicine, energy research, world religions, the healing arts (Reiki, Pranic Healing), coaching and image consulting. Piane is also a certified practitioner in NLP (Neuro-Linguistic Programming), Time Line Therapy and a Clinical Hypnotherapist (CHT). She tailors her private sessions with combinations of these modalities and intuition. Renee has been creating and producing events, seminars and programs that open people's hearts and build community. She has had years of experience in the beauty and skin care industries as a cosmetologist and makeover expert and image consultant.